Club Penguin Cheats by Mimo777 Club Penguin Cheats by Mimo777: New Instructions and Legend Now In Club Penguin Fire Dojo! New Instructions and Legend Now In Club Penguin Fire Dojo! Cool Look! You can now see how to play Card Jitzu Fire! You can also see how to play the game too! Lots more cool Club Penguin stuff coming this week! I'm full! I ate too much! Did you? CLUB PENGUIN HAS BEEN DOWN A LOT TODAY! IT'S UP FOR ME RIGHT NOW. Mimo Scavenger hunt coming this Sunday! I'm 40% to getting the shoes! thx for the news mimo im gonna go check did u see my other comment? What did u have to eat Mimo? Ok wii wii wii 1 u shouldnt post little things that dont make sense like lol we need things here like '' yay mimo thx for the latest cheats'' thats an example hope it helps! Lol mimo is today an event or something cuz you're full? !And lol you said Card-Jitzu!!! mimo have u noticed there is a black puffle on the home page? AWESOME! Also HAPPY THANKSGIVING TO THE AMAZING, AWESOME, GREAT PENGUIN KING MIMO! Im having a great thanksgiving! XD i love pumpkin pie! I'm 10% to the helmet! Mimo are you a member on Club Penguin or a non-member because on the post with the sleds you say that we should check out the sleds for u and on this post it shows you in the Fire Dojo.So you are a member right? Fire ninja hideout? there is no fire ninja hideout lol. mimo, this isnt about the fire suit, but i think we should start a riot because there arent ANY new missions. when there were missions, i felt that club penguin was a good website, but every now and then it gets boring on cp. lets start a riot stating that we need more missions!!!!! I think you're talking about the Fire Dojo! It's in the Ninja Hideout on the stone wall with the Fire sign. Click that, and the entrance to the Fire Dojo will pop up! Im still working on my mask! Thats a bad idea because you could get banned. Me too!I went to my aunt's stuffed my self and at my house! Mimo is a member because BillyBob gave him a 1 month membership. You can get to the volcano from the ninja hideout. awsome you rule you should try to go to cpcheats and click the 2nd option and click cp revoulution and download it its FREE! 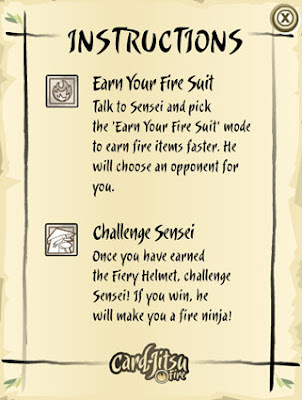 i found out that once your a fire ninja your amulet changes. you then cant see the pic of the flame, it's turned red. p.s i am a fire ninja! In a few years, they'll be card-jitsu water and card-jitsu snow, if you beat all of it, you'll be like a super ninja. 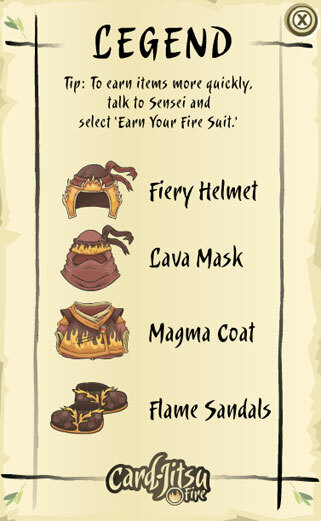 I'm trying to get my magma mask!! I got them but good luck dude!! MIMO IM FINALLY A FIRE NINJA! I figured out why the dojo is where it is. If you look at the dojo from the courtyard, you see three things behind it. A volcano(fire), a waterfall(water), and mounains(snow)! The dojo is in that spot because it is close by the three elements! If there is a card-jitsu water and a card-jitsu snow, I bet that is where they will be! I went to Olympia for Thanksgiving. Washington's capitol. pretty intense...not. There is no fire ninja hideout. If you're talking about the fire dojo, you can get there from the ninja hideout. Wait... Is that tied on?" Look in the ninja hideout. There's this post with a flame on it. Click on it, then an entryway will show up. Once you go in it, there it is! if you become a fire ninja you get a red thing where the fire goes on your amulet! Hey people! Sorry about my double- post earlier, my computer blacked out and posted it again.